Home big muscles fat burning nutrition supplements taurine Taurine: benefits, side effects, warnings. What is it good for? 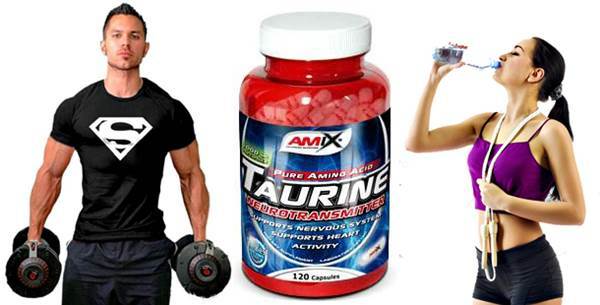 Taurine: benefits, side effects, warnings. What is it good for? Taurine: uses, side effects, interactions and warnings. Does taurine help me lift more weight in my workout routine? Is taurine good for improving sports performance and overall health? Should I take taurine as a supplement to complement my diet? These and other questions will be clarified throughout this article ... besides mentioning what is taurine itself and for what could it be good for? Taurine: pros and cons: usually the cons of taking taurine are not yet well studied since they always analyze the drinks that in addition to this compound, also contain caffeine, carbohydrates and other compounds ... these are the famous energy drinks ... as for the pros, read the whole article very well since I will analyze some studies where the subjects took taurine as a dietary supplement. Does taurine serve to lose weight? No, taking supplements with taurine will not help you lose weight (fat burning) ... it will not help you "burn" fat so no matter if you "kill yourself" at the gym ... well, of course if you train hard and take care of your diet, then you probably will be able to burn Calories and lose weight ... but this will not be thanks to the consumption of taurine but to exercise as such and an adequate diet. Before continuing, I think it is appropriate to clarify the difference between Taurine and L-Taurine. In some how are the same thing... the name changes a little because the "L" that comes from the term "Levorotatory", simply means that it is a compound suitable for the human consumption. Some manufacturers put it in the supplements they sell and some do not. It seems putting or not putting the "L" before the name (as for example also in the case of L-carnitine) is something optional. First you must know what is taurine and what is it for? Taurine is considered by some scientists as an amino acid with a chemical composition that makes it a relatively small molecule, and its main function has to do with the metabolism of fats since it contributes to the formation of bile which is a liquid that allows fatty acids (from fats) to be emulsified for easy digestion. Taurine also works as an antioxidant and anti-inflammatory, participates in the regulation of nerve impulses, improves lipid profile and regulates blood pressure, among other functions ... it is also worth mentioning that a Taurine deficiency can produce negative effects on the mentioned functions and also cause heart diseases. Taurine can be found naturally in the tissues of many living things. However, its presence in foods once cooked is low and therefore it is an amino acid that can be synthesized from other amino acids. But under certain conditions, some organisms can not synthesize it and for that reason taurine is considered a "semi-essential" or "circumstantially essential" amino acid. For this reason taurine intake is sometimes necessary through dietary supplements. The main negative effect because of the lack of taurine and / or the inability of an organism to synthesize it has to do with the slowing down of the digestion of foods, especially those containing fats and cholesterol, since as I mentioned taurine is fundamental for the production of bile. On the other hand, taurine deficiency could also cause cardiocirculatory disorders and symptoms such as hypertension or chest pain as well as renal dysfunction and abnormalities in the development and normal growth of tissues. At the same time, when a person does not present good amounts of taurine and / or can not synthesize it from other amino acids, the functions in their central nervous system can be altered, worse even when this deficit occurs from an early age ... It should be mentioned that taurine deficiency can cause severe damage to the neurons of the retina. Now what can happen when you consume a lot of taurine? Consuming too much taurine can cause our body to generate very high amounts of uric acid which could cause arthritis and in severe cases the disease known as Gout. However, the appearance of these pathological symptoms are mainly manifested by some renal deficiency, mainly. How was taurine discovered and where does its name come from? Its name derives from the latin "Taurus" (which means bull) since it could be isolated for the first time from the bile of the bull in 1827 by the German scientists Friedrich Tiedemann and Leopold Gmelin. A few years ago the presence of taurine in some small polypeptides was identified, but so far no aminoacyl tRNA synthetase (an enzyme that catalyzes the esterification of an amino acid) has been identified that is responsible for incorporating it into the tRNA (transferring RNA). In scientific literature it is often classified as an amino acid, but lacking the carboxyl group, is not strictly one. It is a derivative of the cysteine ​​amino acid containing the thiol group; And is the only known sulfonic acid (they have the unique tendency to bind to proteins and carbohydrates strongly). Study 1: In one study, the effects of acute administration of taurine on the performance of running at high intensity were determined. For this, performance was evaluated in men with an average age of 26 years, which were divided into two groups, one group took 6 grams of taurine daily and the other group took a placebo. Participants performed each training session on a Treadmill until failure or complete fatigue to determine the peak VO2 ... this was carried out for one week. In other words, the group that consumed taurine could last longer at full intensity before reaching full fatigue, but the results do not show a significant difference between the two groups ... that is, the time obtained was not "Brutal" to say "yes or yes" consumption of taurine markedly improved performance. Study 2: Another study evaluated whether taurine intake for 7 days would increase levels of this amino acid or other amino acids in the skeletal muscle ... and if this factor would also affect the oxidation of fat (fat burning) and the increase of muscle mass. As for taurine can influence the gain of muscle mass, neither is directly verified this factor ... although by helping to increase the concentration of the mentioned amino acids, this could increase the physical performance during the High intensity training session with or without lifting weights and therefore may have an indirect effect on the increase of muscle mass. Study 1: Milioni, F. et al. (2016). Acute administration of high doses of taurine does not substantially improve high-intensity running performance and the effect on maximal accumulated oxygen deficit is unclear. Study 2: Stuart D. R. Galloway, Jason L. Talanian, Anna K. Shoveller, George J. F. Heigenhauser, Lawrence L. Spriet (2008). Seven days of oral taurine supplementation does not increase muscle taurine content or alter substrate metabolism during prolonged exercise in humans.